A while back I was talking about sunscreen because I was looking for a few things to add to my usual routine — I need to use more protection, more regularly, here. I went out and bought a few things to add to my arsenal. I thought I’d share for any other interested folks out there. Eucerin’s new Everyday Protection Body Lotion SPF 15. I have to admit I am disappointed with this — on hot & humid Baltimore days, it doesn’t absorb into my skin. That means I sit at work for most of the day feeling like I have a slick film covering my arms and legs. When the humidity and temperature are not so high it seems to absorb more quickly. I’m hoping that next summer, some competition will be available. (Lubriderm also has an SPF lotion out — Daily Moisturizer SPF 15 — but I haven’t seen it anywhere. The Eucerin I did spot at my local Rite Aid, though it was after I’d already ordered it online.) At this point I’m only using it on my upper body on days when it’s not too hot & humid. It goes on my legs every day. ChapStick Ultra 30. Betcha didn’t know they made that, huh? Only complaint here is that this gets the taste of sunscreen in my mouth. Not so pleasant. I’ve reserved this for when I’m outside for long periods. As a side note, the blue tube kind — ChapStick Moisturizer — is SPF 15. I’m trying to make sure to apply this more often than I normally would in the summer. Not sure if I will replace this next year/when it runs out. Kiehl’s Ultra Protection Water-Based Sunscreen SPF 25. This is all but gone now (I just have some in a little travel tube). It’s a pretty nice formula that I was using on my face until the Olay arrived. Since it’s not formulated for the face, I found it to be a little too heavy; that said, it didn’t cause me any problems with my complexion. I don’t plan to buy more of this, but I am re-using the bottle — it’s a great size for traveling. Target SPF 45 Sunscreen Lotion. This is their equivalent of the Neutrogena Healthy Defense line. This I rely on when I’m going to be outside for long periods of time. Like many SPF 45 lotions, it doesn’t absorb as well as you might like. But if you’re outside for long periods of time on a summer day you’re probably sweaty, so what’s another layer? Olay Complete Defense Daily UV Moisturizer SPF 30. If I’m going to be outside for any length of time, I use this in the morning in place of my year-round use of their All Day Moisture Lotion SPF 15. I was a little worried about this being too heavy, but it absorbs well. Not pictured is a tube of Neutrogena Ultra Sheer Dry-Touch Sunblock SPF 45. I grabbed this on vacation (we were at WalMart and it was cheaper than I’d spotted it anywhere else) while out running errands with Mom. I’ve only used this a little bit so far, but it has become my preferred upper-body sunscreen for walking to work. This does not give you that feeling of having another layer on top of your skin. It seems to absorb, and if it’s not absorbing it’s not leaving a slick feeling behind on my arms. It might seem silly to use the Target ripoff as well as the Ultra Sheer, but the Target brand is cheaper — if I’m not going somewhere that I feel I need the ultra sheer aspects of the Ultra Sheer, I don’t want to use it since it’s so much more expensive. I really like the idea of a body lotion with SPF in it, since that means I can apply that in the morning as part of my normal routine, and SPF 15 is decent enough for the walk to work. If someone else comes out with a version of this that absorbs better, I might eliminate the Ultra Sheer altogether. 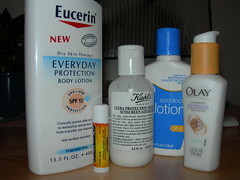 I’ll be interested to see what types of SPF body lotions come out next year — I think there is definitely a market there! I’d love to see someone come out with an SPF 30 body lotion that absorbs better than this one does. All this seems to be working pretty well, though of course there is the usual catch with sunscreen — it only works if you apply it. I got a bit of a burn on my back on vacation since I stupidly didn’t have Bill or Andrea help me put some sunscreen on (so stupid — I had the sunscreen with me and Andrea paused to put hers on while I was dinking around with my camera, or something). In the last week or so, I’ve also found myself thinking “oh, it’s not so hot and humid this morning, I don’t need sunscreen. . . . pause . . . What? No, the sun is out, thus you need sunscreen.” I skipped on an overcast day when rain was predicted, but that’s it. And even then, I knew I probably shouldn’t have skipped. I think this kind of thing is a trap a lot of folks fall into. My other weakness is that I don’t reapply before I leave work — I just haven’t managed to remember to pause and do this regularly, at least on my upper body. As a result my arms, shoulders and neck are more evenly tanned than I have seen them in quite some time. It’s weird. (Side note: some of this is probably inevitable, given that I’m now walking everywhere intead of hopping on and off the T.) Normally by the end of the summer I am just starting to make out tan lines (except for any late-spring/early-summer “surprise it’s a really nice day!” burns), but that’s not the case this year. It’s not anything to panic about, but it is an indicator of sorts that I need to get my act together and figure out some way to remind myself to apply 30 minutes or so before leaving work. If I liked the Eucerin I probably would have brought some of that in and left it on my desk. Maybe I should just do that anyway, since if I’m just heading home I won’t care about the absorption problem. As a side note, I was trying to get my hands on a tube of Blue Lizard, which came highly recommended, but it seems nearly impossible to get in stores. I have seen the sport version at a CVS here, but I was looking for the regular or sensitive (or even the baby) thinking that would be a lighter formulation better suited to wearing for the walk to work. I will have to try to remember to order online next spring. Agree re: the Eucerin and humidity. I loved the stuff at first, but as the Los Angeles summer has become more sticky, I can’t stand it. I’ve switched to Aveeno Baby SPF50 and will never look back!! I second Abby’s recomendation of Aveeno. I use the “ultra calming” SPF 15 as my daily face/upper body (I have complexion issues I know). I don’t know if they make a higher level w/ the same “ultra calming” but it might be a decent winter sunblock.